When I was getting ready to have my baby boy I knew I wanted to use the most natural (and affordable) products I could find that would be best for his skin when he came into this world. I compared tons of products and researched what would be most soothing, hydrating, scent-free, paraben-free, etc. and protect his sensitive skin from harsh toxins. 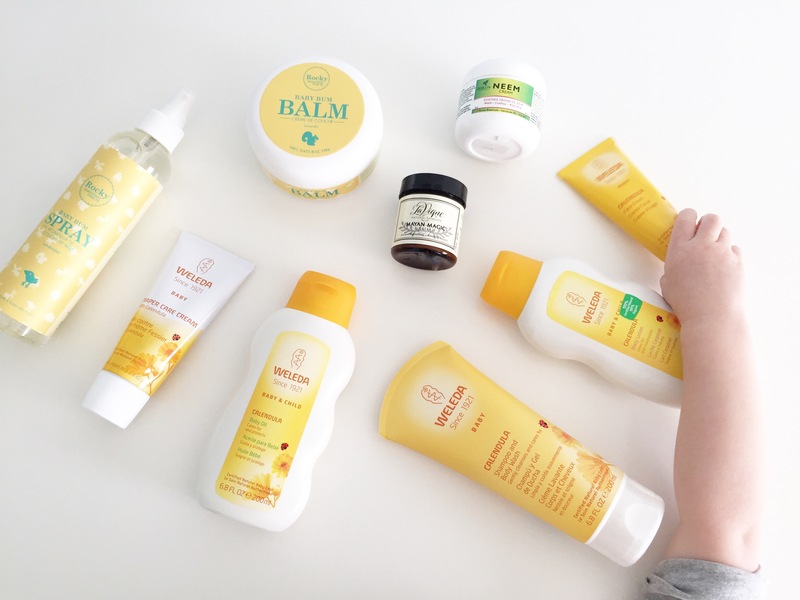 I’m sharing the best natural skincare products for babies and toddlers that actually work and where to buy them at a reasonable price! Weleda Baby Calendula Shampoo & Body Wash – ON SALE right now $14.27, orig. $16.79 – This is the product I’ve used on Luke since day 1. (I even packed it for the hospital and requested they use it for his first bath versus the generic brand they were offering.) This all natural baby wash is so gentle and silky smooth and doesn’t dry him out. It’s non-scented and cleanses his skin without leaving a gross film like other synthetic detergents. My favourite part about this body wash is that it brings out his natural baby smell compared to other products that are full of perfumes. It’s made with organic and natural plant-based cleansers like calendula flower extract and almond oil. 2. Weleda Calendula Baby Oil – This is the oil I use right after his bath and I incorporate it into a little baby massage for him before bed. The baby oil is naturally scented with the combination of organic calendula and chamomile flower extract, and other natural essential oils. It leaves his skin so hydrated and smooth. 3. 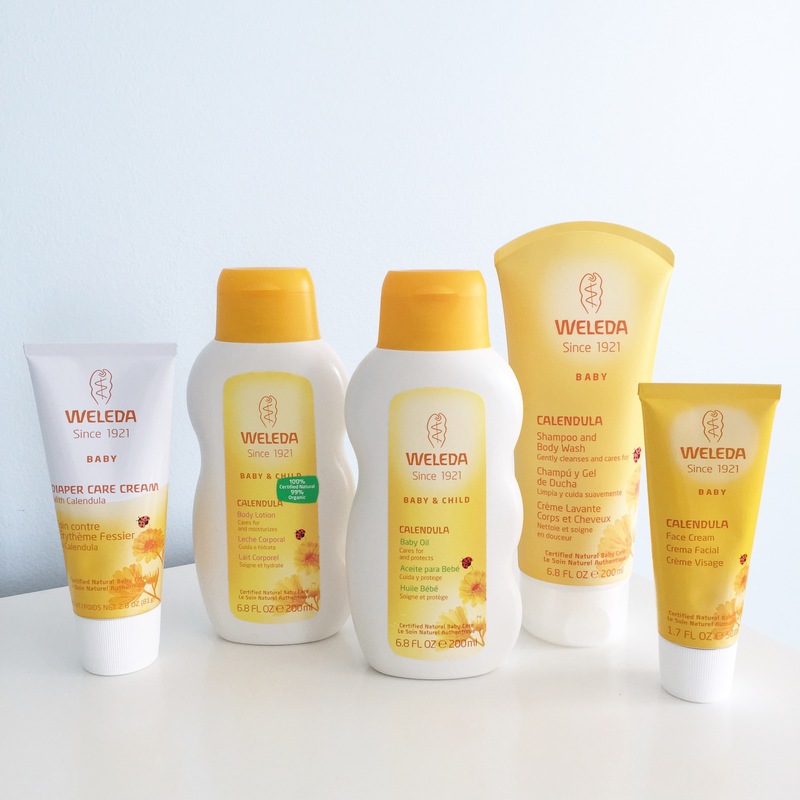 Weleda Calendula Baby Lotion – When I travel with Luke I end up switching to this lotion because I would hate to risk a baby oil leak in my luggage. This is another great all-natural product of Weleda’s that’s nourishing on skin. 4. 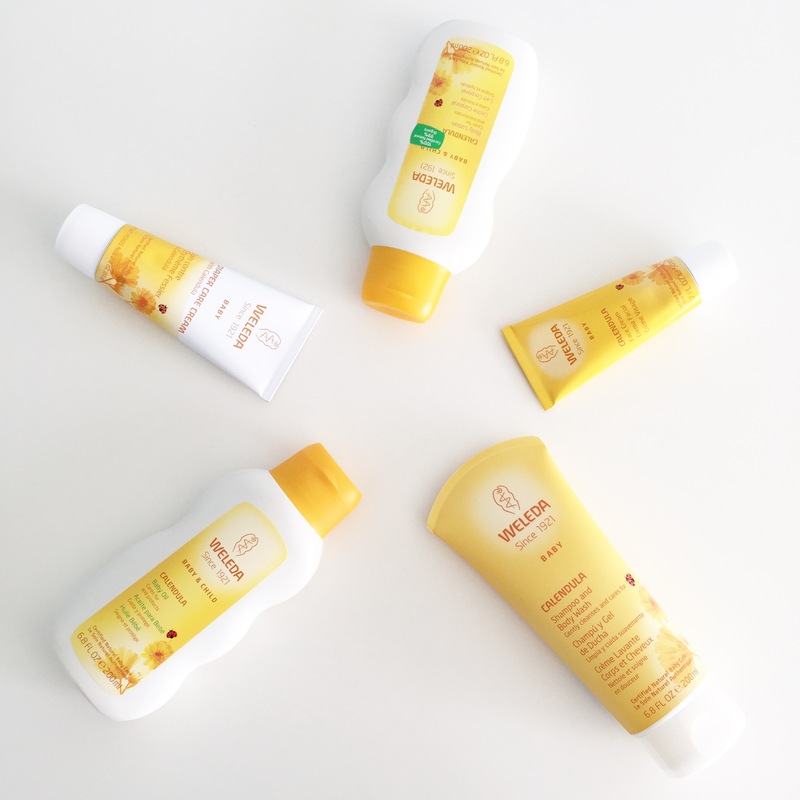 Weleda Baby Calendula Face Cream – These days Luke loves applying this face cream himself! It contains essential fatty acids from almond oil and beeswax that moisturize the skin. 5. Rocky Mountain Soap Co. Large Baby Bum Balm – Luke received this bum balm as a newborn gift and we have never looked back. It smells so amazing and is extremely soothing on his little bottom, and it’s a way better option than petroleum based creams. I recently purchased the spray bottle form of the bum balm now that Luke is a little older because he doesn’t need as much application. 6. Weleda Diaper Care Cream w/ Calendula – ON SALE right now $11.89, orig. $13.99. When Luke is starting to get a little redness I put on a generous coating of the diaper care cream and it’s gone within hours. Once his sore bottom is all healed I then switch back to the Rocky Mtn Soap Baby Bum Balm. 7. 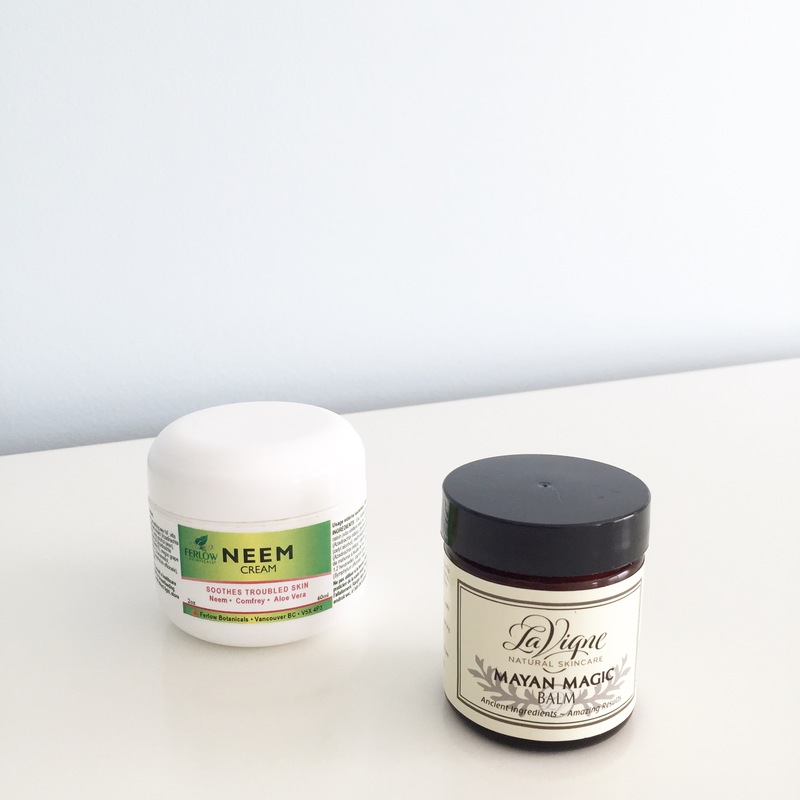 Ferlow Botanicals Neem Cream – I bought this cream from the Canadian College of Naturopathic Medicine in Toronto after I took Luke for an 8 month check up. I wanted an all-natural cream to have on hand in case Luke ever got Eczema. I haven’t had to use it for Eczema but I’ve used it on his cheeks here and there when he is teething or on really dry days when it’s -30 in Calgary and I want to keep his skin comfortable and hydrated. It’s fairly thick so it works well moisturizing the skin. 8. LaVigne Organic Skincare Mayan Magic Balm – My sister introduced me to this magic cream and it really is just that – magic! When Luke got a really bad diaper rash from teething I was in desperate need for something fast acting so I bought it from Nutrition House for $19.99 (50 ml). I thought I was going to have to see the dr. and get a prescription to cure his poor rash but this worked overnight. It really is magic in a jar. It also works on many other wounds, cuts, and rashes! It’s a fairly dense cream but really smooth and actually stays on your skin without easily rubbing off like regular lotion. Shop Smart Tip: You can get it for a few dollars cheaper on Well.ca. I would definitely say all the products listed above work great as baby gifts too!! I would never hesitate to buy someone quality all-natural skincare products for their kids. Thanks for the suggestions! These items are on my list for the next baby shower I attend! Yay! I’m so happy these ideas could help! Great post! Love this product roundup as gift ideas for babies and toddlers. So glad I know where to get them for the best price! Thanks for sharing. I’m happy this post could help! Thanks for the feedback.